CCI Controls, the leading manufacturer of residential and commercial detectors, offers this automatic gas shut-off system designed specifically for residential and commercial use. This system was developed because of the varying demands dictated by the residential and commercial user. It is particularly well suited for below grade installation where city and state laws require its application, and this unit can instantly shut the building's gas service off by throwing the detector's on/off switch. This action shuts the gas service off at the valve. In the event of a community power outage, the service battery will provide a source of energy that maintains its operation for up to 5 continuous hours. Should Propane or Natural Gas be detected, the alarm is sounded and the gas supply is shut off at the valve. The gas will remain off until the detector is manually reset. As many as three remote detectors can be wired in tandem to the master detector. 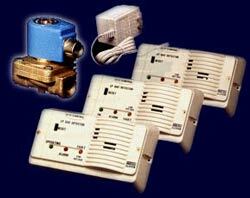 When gas is detected at any point, the master & remote units communicate with each other to control the valve. CCI Controls, 5052 Ceclia Street, South Gate, CA 90280-3511. Tel: 323-560-6060; Fax: 323-560-1136.